The new rule applies to institutions with assets of $1 billion or more, and will likely go into effect in 2019. The National Credit Union Administration is the first of a group of six federal bank regulators to make available a joint proposed rule on incentive compensation arrangements maintained by financial institutions. Initially, these bank regulators issued a jointly proposed rule on incentive compensation arrangements back in 2011. The new proposed rule, which supersedes the 2011 rule, is updated based on developments in incentive-compensation programs maintained by financial institutions, bank regulators’ experience with these programs and comments received on the initial proposed rule. The proposed regulations would apply to financial institutions with assets of $1 billion or more. The rules vary by size, with institutions $50 billion or greater subject to significantly more prescriptive requirements. Requirements include, but are not limited to deferrals, forfeitures, downward adjustments and clawbacks for “senior executive officers” and “significant risk takers.” Depending on the timing of final rules, the effective date of these requirements isn’t likely until 2019. Section 956 of the Dodd-Frank Wall Street Reform and Consumer Protection Act requires bank regulators to jointly issue regulations or guidelines: (i) prohibiting incentive-based compensation arrangements that encourage inappropriate risks that provide excessive compensation or that could lead to a material financial loss, and (ii) requiring those financial institutions to disclose information concerning incentive-based compensation arrangements to the appropriate Federal regulator. The bank regulators are under no deadline by which to issue a final rule. Once a final rule is adopted by the bank regulators, covered financial institutions would become subject to the final rule 540 days after its publication in the federal register. An incentive-based compensation arrangement plan with a performance period that begins before the final rule’s effective date would not be subject to the final rule. If the final rules are adopted by year end, they would initially apply to calendar year incentive-based compensation arrangements with performance periods beginning in 2019. Level 1 and Level 2 Institutions would be subject to significantly more prescriptive rules than the rules that would be applicable to Level 3 Institutions. However, regulators would have the discretionary authority to subject a Level 3 Institution with assets of $10 billion or more to the more rigorous rules on a case-by-case basis. Incentive arrangements cannot encourage inappropriate risk by providing excessive compensation or encourage inappropriate risk that could lead to a material financial loss. Incentives must include both financial and non-financial measures of performance (including risk-based measures), and the non-financial measures must be able to override the financial results. Additionally, amounts to be awarded must be subject to downward adjustment to reflect actual losses, inappropriate risks or compliance deficiencies. Incentive arrangements must include effective controls and governance, including oversight by the Board of Directors. Covered financial institutions must create annual records documenting the structure of incentives and compliance with these regulations. The records must be maintained for seven years and be available for regulators to review upon request. Certain of these additional requirements would solely apply to “senior executive officers” and “significant risk takers”. Senior executive officers would include thirteen specific roles identified in the proposed rule (e.g., CEO, CFO, COO), the heads of major business lines and the heads of control functions. Significant risk takers would include individuals whose compensation is among the highest in the organization (top 5% for Level 1 Institutions and top 2% for Level 2 Institutions) or who may commit or expose 0.5% or more of the institution’s capital. The deferral cannot vest faster than on a pro rata annual basis. Deferred amounts cannot accelerate except in the cases of death or disability. The deferred amounts cannot increase except based on share price, interest payments or a change in interest rates. The sole use of transaction revenue or volume without regard to transaction quality or compliance with sound risk management would be prohibited. Establishment of a number of specific policies related to incentive compensation and related governance. These proposed rules, once finalized, will have significant impact on the pay mix and program structures for many U.S.-based financial institutions. 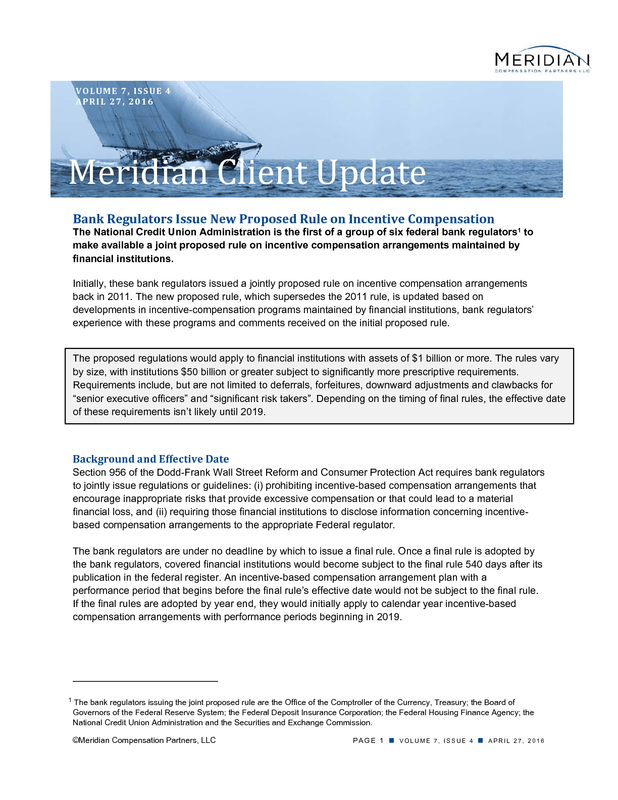 Meridian will continue to provide updates on these new rules and their impact on emerging compensation practices. This report is a publication of Meridian Compensation Partners, LLC, provides general information for reference purposes only, and should not be construed as legal or accounting advice or a legal or accounting opinion on any specific fact or circumstances. The information provided herein should be reviewed with appropriate advisers concerning your own situation and issues. The bank regulators issuing the joint proposed rule are the Office of the Comptroller of the Currency, Treasury; the Board of Governors of the Federal Reserve System; the Federal Deposit Insurance Corporation; the Federal Housing Finance Agency; the National Credit Union Administration and the Securities and Exchange Commission.